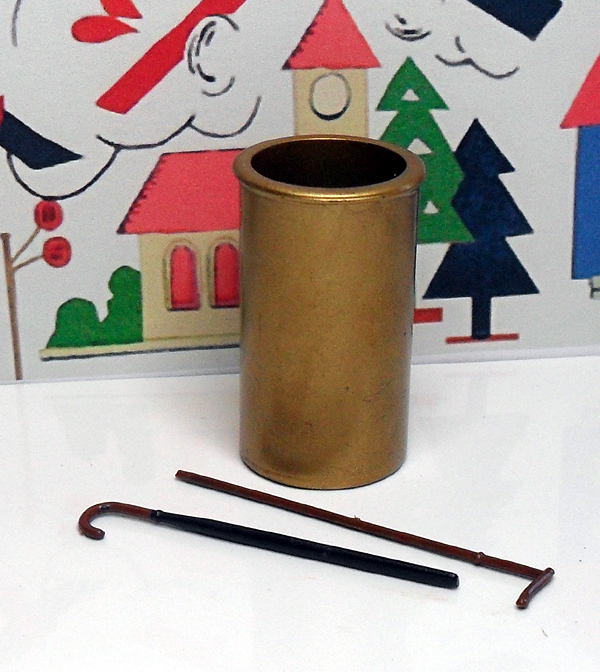 Here are some more exciting items for your Doll’s House. 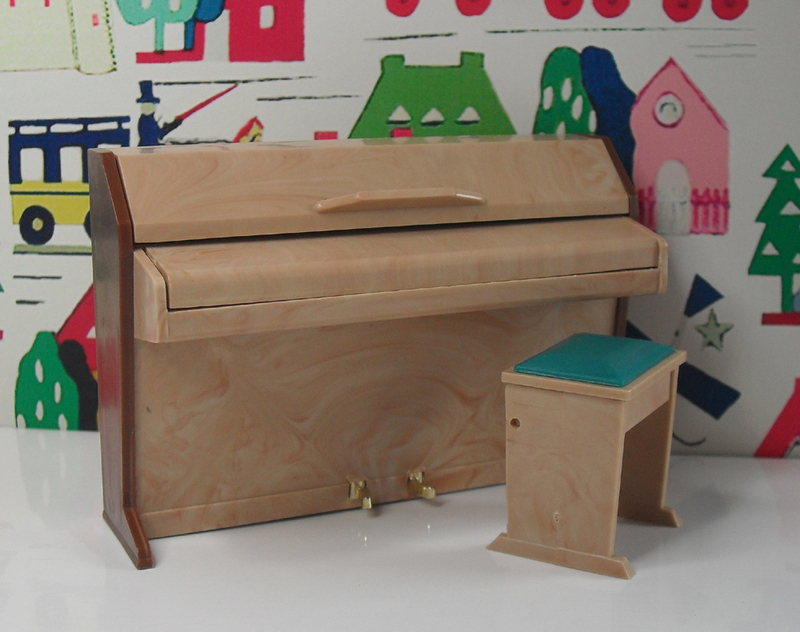 A Mini-Piano for the musically minded doll, and a beautiful Tri-and Dolls pram for your Dolly’s own doll. 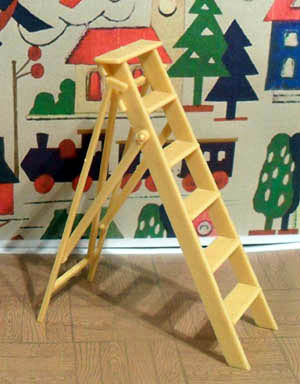 And for the nursery a charming Queen Anne Doll’s House and a Tri-ang Rocking Horse. The hose is missing from my Hoover, along with a little attachment, I must look online and see if Hoover supply spare parts. 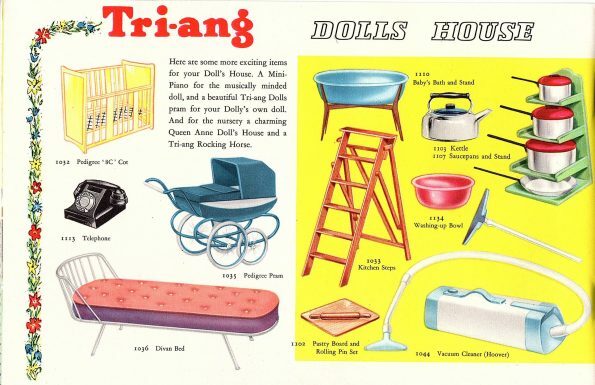 The Tri-ang Dolls’ House Furnishing plan supplies every dolls’ demands of floor and wall covering. 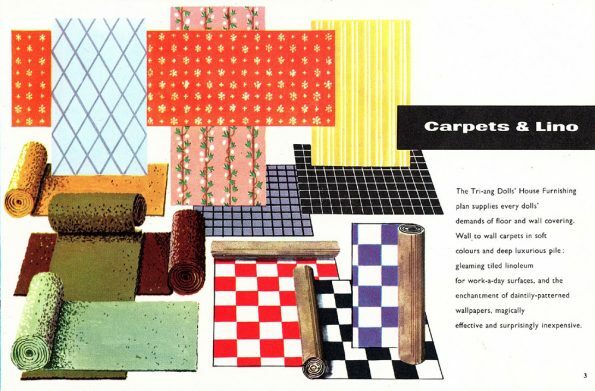 Wall to wall carpets in soft colours and deep luxurious pile; gleaming tiled linoleum for a work-a-day surfaces, and the enchantment of daintily-patterned wallpapers, magically effective and surprisingly inexpensive. 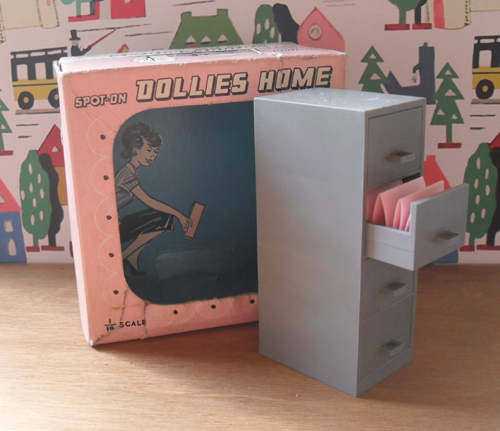 Although this Filing Cabinet  is not actually an Accessory, I was not sure where to put it. I managed to take this picture, so it looks as if the lady is taking files from the cabinet. 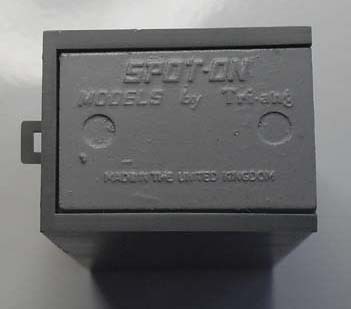 The Filing Cabinet is one of the few items that is labeled with the Triang name. Wall Covering Carpets and Lino. Another wonderful Tri-ang idea. 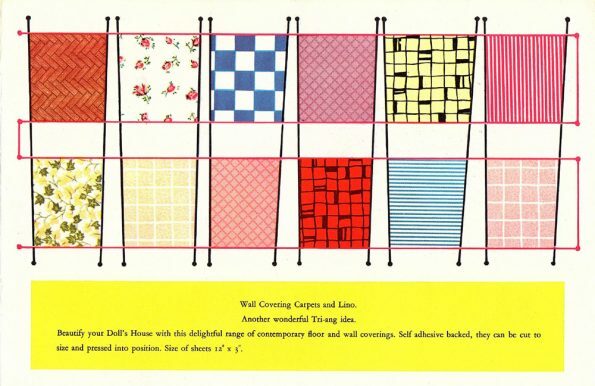 Beautify your Doll’s House with this delightful range of contemporary floor and wall coverings. Self adhesive backed, they can be cut to size and prressed into position. Size of sheets 12″ x 3″. 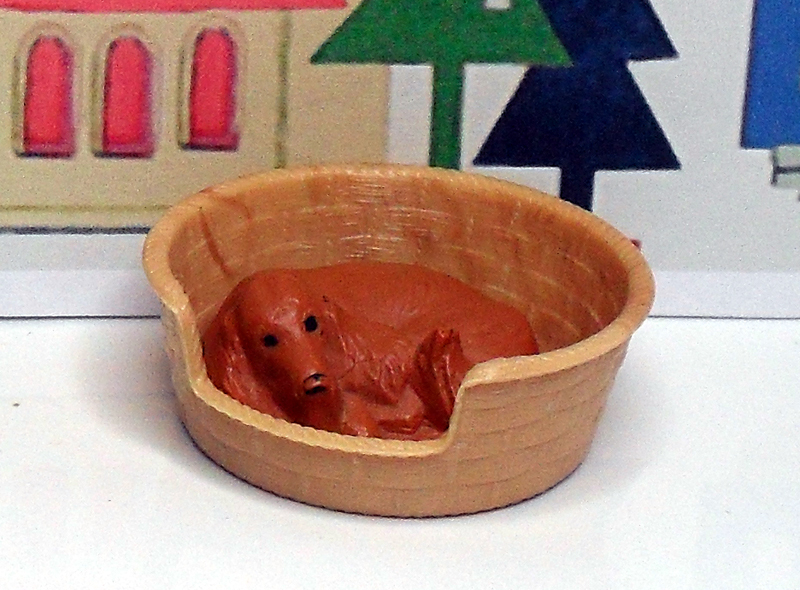 This is the newest addition to my Triang collection, a dog complete with basket. I don’t have any people living in my houses, but at least they will have a pet waiting for them. In the mean time, I will have to look after him. 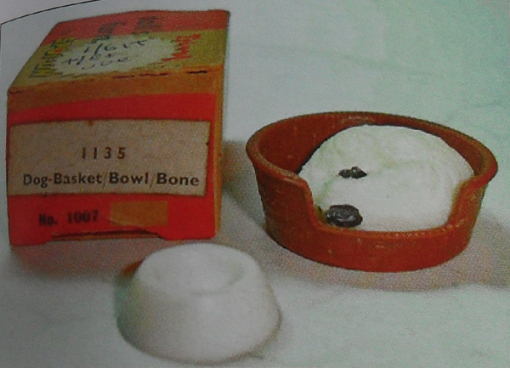 The first Triang dog was white with black ears, and as stated on the box, came with a bone and bowl. 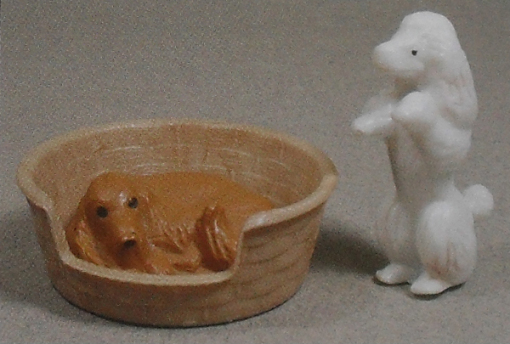 The Spaniel, in its basket , was available until around 1968. It was replaced with a white poodle on its hind legs, but only came with Jenny Home sets JH45 and 50, not sold separately. 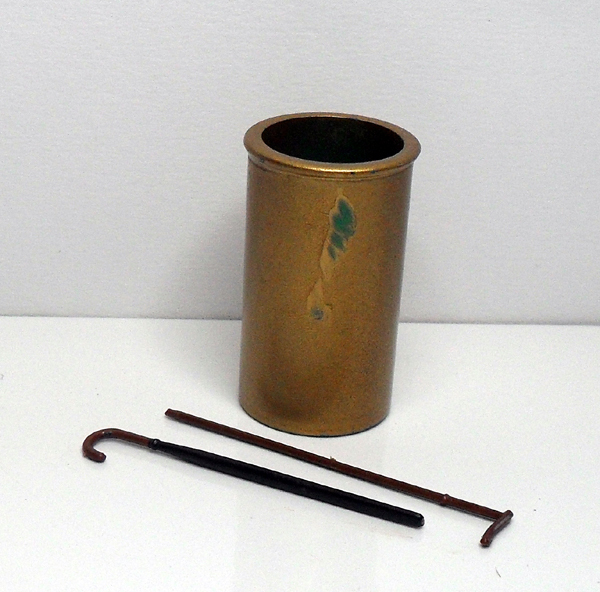 The original Umbrella Stand was blue, and came in a box with a walking stick and umbrella. This is a lovely set of silver items, some are listed as single items, but appeared in various combinations in Jenny’s Home Sets. 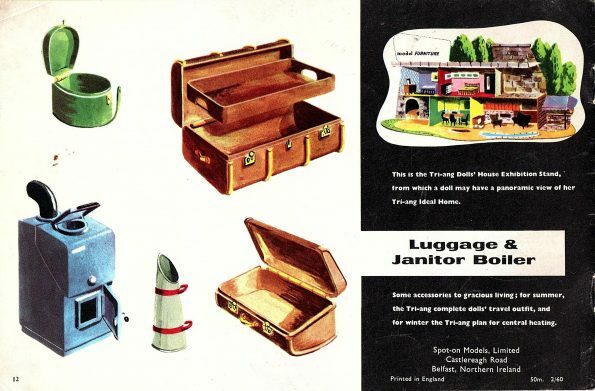 Triang Luggage 1142/1157, it consists of a Cabin Trunk, Suit Case and Hat Box. 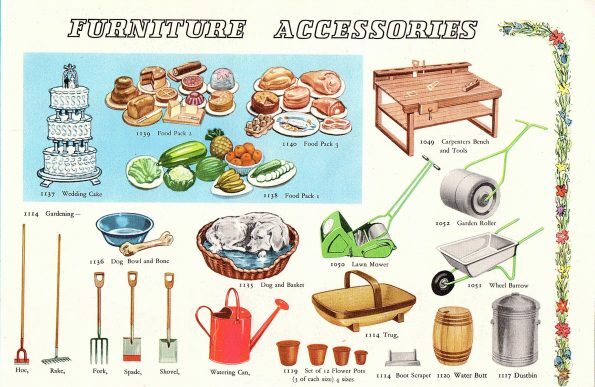 The luggage is not quite as shown in the 1960 catalogue. 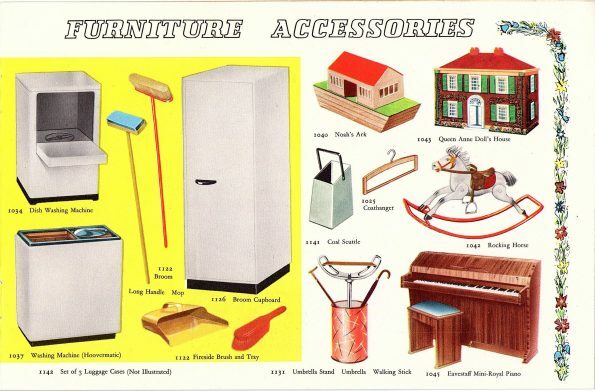 This Set did continue into the Jenny’s Home range of furniture. 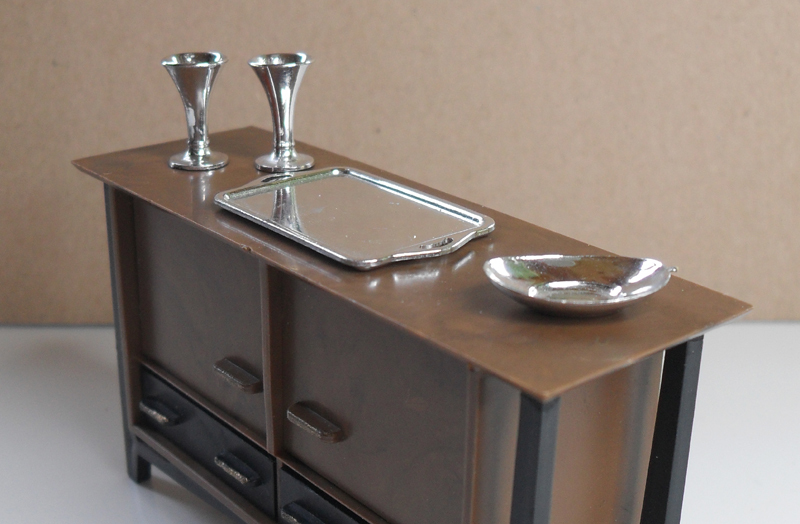 The colour was changed though to brown with cream handles, it has always been sold as a group of three items. The Luggage Set has a tendency to warp, but they look ok from the front. 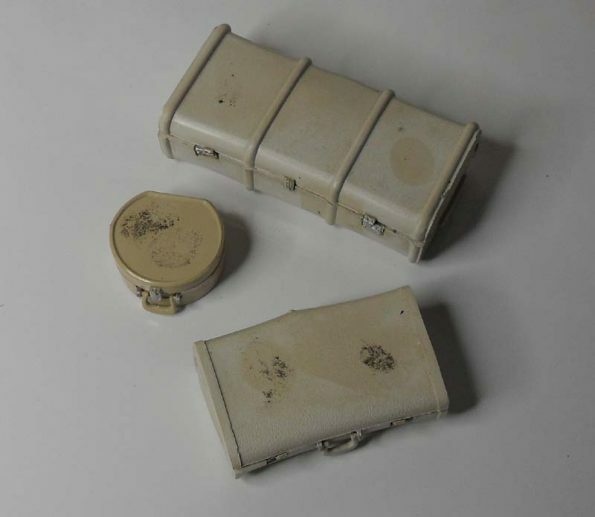 This picture shows the inside of the suitcase. 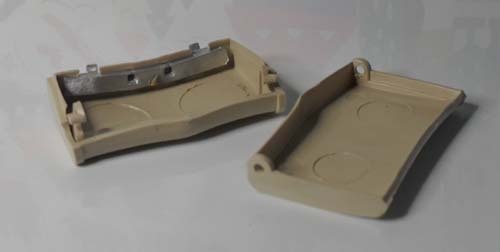 There is a piece of silver painted plastic which has a fitting for the handle and the little claps lock. 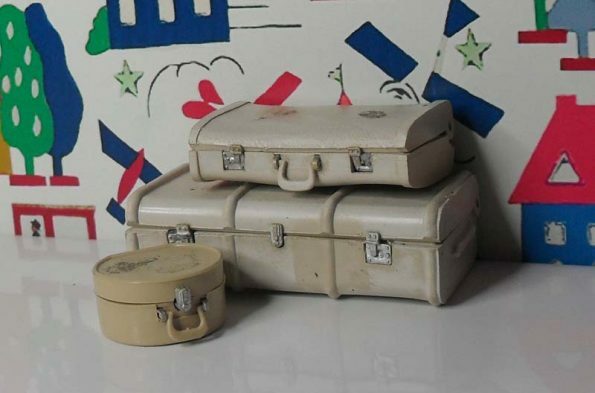 For the size of this luggage the detail is very good, and not something you expect in a Triang piece. 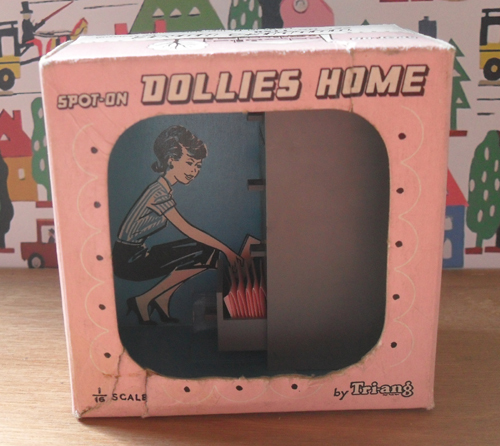 For the ‘Do it yourself’ enthusiast, we have a wide range of dolls’ house fittings. 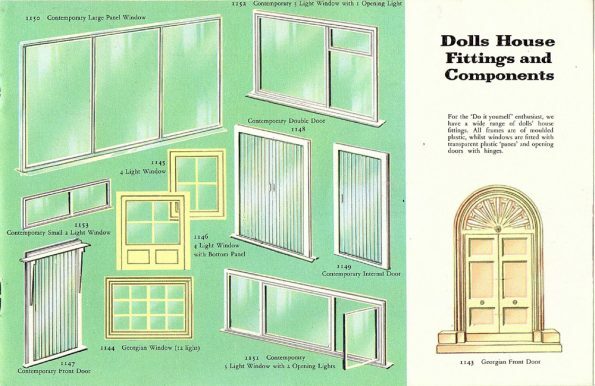 All frames are of moulded plastic, whilst windows are fitted with transparent plastic ‘panes’ and opening doors with hinges.